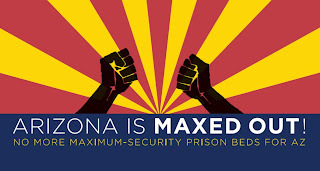 Arizona Prison Watch: 2012 AZ: Vote for Education, Not Incarceration. Caroline Isaacs and Matt Lowen from the American Friends Service Committee office in Tucson have done a lot of good work across the state fighting for prison reform and exposing human rights abuses. AFSC-Tucson's site has some great resources on prison privatization in Arizona, as well as on supermaxes and solitary confinement. Check out their links here afsc.org/office/tucson-az. Also check out the blog "Cell-out Arizona" at the Tucson Citizen. Voters across the state are taking notice. One year of prison costs at least $17,000 per person while average per student funding in K-12 schools is less than $8,000. Is it smart spending to pay twice as much to incarcerate, rather than to educate someone? Especially when 43 percent of those released from prison later return? Arizona’s private prisons are overall more costly than equivalent state-run units. Their management and staff are not as qualified or experienced. This leads to compromises in safety, as grimly evidenced by the escapes from the privately run facility in Kingman in 2010, which ultimately led to two murders. Finally, private prisons benefit from keeping people in prison; not from providing programming and preparation to return prisoners to our communities as productive, tax- paying citizens. People running for office are being asked why our prison population is so high, when leaders in other U.S. states across the political spectrum have both reduced prison populations and reduced crime. In doing so, they saved millions of taxpayer dollars. We incarcerate many people whose crimes, including drug offenses, stem from mental illness. Both addiction and mental illness lead people to commit multiple offenses — not because they didn’t “learn their lesson,” but because they are not receiving the assistance (medication, therapy) they need to be able to control their behavior. Cost-effective and safe alternatives such as mental health courts and other diversion programs treat the root causes of their offenses, preventing future crime. All this reduces the costs of corrections, freeing scarce state resources for other critical needs. This election season, thoughtful voters have a real choice. They can choose candidates who will continue the status quo — a costly corrections system and substandard educational system — or they can pick candidates with vision and the courage to stand up to private prison special interests and fight for a smart budget that balances the need for a high-quality educational system and a safe and cost- effective corrections system. — Caroline Isaacs, program director, American Friends Service Committee.